Jarl of Falkreath in the Second Era. He was young when he inherited the crumbling hold after the Orc chief Yashnag slew his father in battle. In a ritual trial by combat, he challenged Yashnag and his champions and defeated them in turn, eradicating the Orc chiefdom of Western Falkreath in 2E 367. 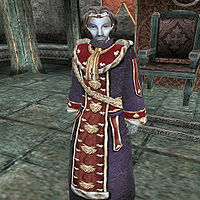 Haskill was the Chamberlain of Lord Sheogorath, "the one constant in the ever-changing whims of the Madgod". He often takes on the appearance of an elderly man in a melancholy yet flamboyant suit. Just like his colleague Dyus, former Chamberlain of Lord Jyggalag, his origins are unknown. According to him, however, he was under the service of Sheogorath since the "beginning", which implies some time in the Dawn Era. He took care of all of the more administrative and mundane duties involved in running the Shivering Isles. Haskill has never visited Tamriel and, according to him, has no desire to. He has a strong dislike of Mehrunes Dagon, mortals and Order. His son had the same name as Mankar Camoran, which makes it seem as though they are one and the same. However, Mankar's race in Oblivion suggests otherwise (in Oblivion, he was an Altmer. However, the mother of Camoran's son was a Bosmer, as was the Usurper himself. According to Notes on Racial Phylogeny, the race of the mother is passed onto the son or daughter, furthering the argument that Mankar Camoran is not the son of Haymon Camoran). Empress Hestra ruled in Tamriel during the First Era, circa 1029. She expanded the Empire, adding Colovia and all of High Rock in 1029 when she defeated King Styriche, the Vampire of Verkarth. During her reign, pirates and brigands used the swampland of Black Marsh as a base for launching attacks on merchants off the southeastern coast of Tamriel. She instigated an aggressive anti-piracy campaign in 1E 1033 that eventually led to the capture of the most infamous pirate, "Red" Bramman. Hestra is also known to have improved the road system of her empire during her reign, a policy continued by the Reman emperors in later years. Around the same time as the anti-piracy campaign, Hestra's forces worked to bring the Reach under their heel. While many of the various kings in the region surrendered, holdout rebel forces still inflicted heavy losses. A powerful class of runestone was apparently named after the empress. "Hestra" stones are found in Cyrodiil, and grant the person who activates them a piece of armor and a weapon for a short period of time. Another class are named after Reman, and one theory is that the stones were devised and placed by the rulers whose names they bear. Another theory is that the stones were created much earlier and only moved into position by later rulers. Hlaalu Helseth, a male Dunmer, was born to Queen Barenziah and Symmachus in 3E 376, and he is the older brother of Morgiah. Before the "Warp in the West", he spent most of his time blackmailing, bribing, and even killing nobles in attempts to expand Wayrest's influence. After failing to obtain the throne of Wayrest when his step-father King Eadwyre died, he returned to Mournhold in Morrowind with his mother. Once there, he joined King Llethan's court. After a relatively short period of time, King Llethan died, leaving the throne of Morrowind to Helseth. This caused rumors that Helseth had poisoned Llethan, a telling of events that the late King's wife backs up. After becoming King, Helseth quickly started to cement his hold on power by using the Dark Brotherhood to assassinate a variety of targets, including attempting to kill the recently reborn Nerevarine, though according to Helseth this was a mistake. The truthfulness of this is suspect, as there was another attempt on the Nerevarine's life while guarding Queen Barenziah for the new King. Strangely, King Helseth tends to play up his habit of assassination, as he was one of the driving forces to publish A Game at Dinner, a book that accuses him of murder. In a shrewd political maneuver, King Helseth, representing his own House Hlaalu, formed an alliance with House Dres. Subsequently, he renounced the slave trade, setting the remaining Houses of Indoril and Redoran against him in a bloody civil war. Helseth emerged from the war battered, but without the loss of his essential powers, leaving the slave trade generally destroyed, and slavery without a foothold in all of Tamriel, although the practice persists in remote areas away from Mournhold. Esta página foi modificada pela última vez à(s) 11h32min de 30 de abril de 2015.